It seems this one almost went under and missed the GTW scanner. This was brought to the attention of GTW thanks to the Lemon 64 forum and a member asking about the whereabouts of the C64 version of this game. Snoopy & Peanuts was another cartoon game by The Edge, to be in similiar shape to Garfield – The Big Fat Hairy Deal. It is possible that the game was being developed by the same team. 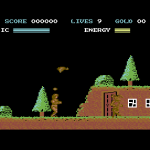 The fact is that the game got released on various platforms, including the 8-bits, but the C64 sadly missed out for reasons unknown. It is very unlikely that a C64 conversion was not in production, so questions need to be asked and answered. As far as we know, there has been no adverts in the like of Zzap 64 about the game, so we have to rely on someday an advert turning up in a multiformat magazine which possibly gives us a screenshot, or even just confirmation of a C64 version being developed. As said earlier, we assume that it would have been done by the guys behind Garfield (Softek). The only people we know who worked for Softek was Ian and Mic, so that is the first place we are trying to see if they know anything or have any leads. The game was fairly well recieved on the platforms it was released on, though it never got the spotlight attention, which is what might make this a particularly hard game to find.. but who knows? If anyone has more information on this title, then bung us an email!.